For best shaving performance, use Mach3 blades with this razor handle. Mach3 is now available on subscriptions. Get started from just £4.95 & save over £4. I shave my head all over, and the Mach3 is by far the best and most comfortable shaver I've used. Where are the Mach 3 sensitive blades? I've tried these and they are not as good as the Sensitive/Power blades. I don't want to change to change to Fusion. Having Used This Razor Since Its Inception I Am In No Doubt This Is The Best Razor Gillette Have Ever Produced. Hard Act To Follow. Become too expensive, now looking for an alternative for the next ten years or so. May grow a beard. Bought by mistake,I now use Fusion Manual. 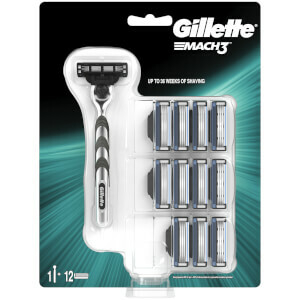 I bought a pack of these by mistake (I used to use them), I now use the Fusion Manual razor which is very good, I believe that the mach 3 is is nowhere near as good. Don`t need 17 blades and "gyro" steering , for fast and quality shaving.Mach3 razor was a revolution and still is.It is an easy and fast way to shave. I find this gives a good shave and lasts a little longer than most disposable razors. I'm in my 40s and work in the Public Services doing shift work. Smartness and maintaining 'standards' is important in my job. I can't remember having ever used a different razor in 20 years.